Owing to our elaborate industrial experiences, we are dedicated towards offering a wide variety of excellent quality Brass Triangle Tower Bolts. The provided bolts are widely demanded for their accurate design and optimum finish. Exclusively manufactured using high-quality brass, these bolts are offered in diverse specifications according to client needs. 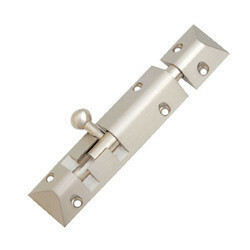 The offered bolts are suitable for door and window fittings for providing decent and modern look. Apart from this, we offer these bolts to our clients after proper quality checks. Founded in the year 1981, we "Shreeji Brass Industries" are the leading Partnership firm, engaged in Manufacturing, and Supplying the finest quality range of Brass Hinges, Brass Tower Bolt, Brass Brackets, and Brass Gate Hook. Located at Jamnagar (Gujarat, India), we have the modern infrastructural unit that comprises of well-equipped divisions such as production, procurement, sales & marketing, quality testing, and warehousing. All divisions are operated under the supervision of our highly experienced professionals. Owing to our wide distribution network, client-centric approach, ethical business policy, timely delivery and affordable price structure, we have gained huge client base across the nation. The products provided by us, are available in various shapes and sizes as per clients' requirements.